Having trouble choosing your first paints? As you walk down the paint aisle at your local craft store, you see brands ranging from $0.99 per bottle to $15.99+ per tube! What are the differences in these brands and how can I determine what I NEED for my specific project? I am so glad you asked :). Let me start off by explaining that when it comes to paint, markers, crayons, pencils, etc. more often than not, you ARE getting what you pay for. Most of the time what you are paying for is the quality of or amount of the specific ingredients present to make the product. Paint is made by grinding different pigments and mixing them with a binder and other fillers. The ratio between these materials are what can affect the pricing. If you have a higher pigment content, your paint will be more expensive since the raw materials required to make such a color are expensive. If you have a lower pigment content, the producer can charge less since it costs them less to make. What is the pigment and the binder and why are they necessary? The PIGMENT is the color you are looking for. Blueberries have a natural violet-blue pigment that causes them to look blue. They are a very vibrant blue and so is there juice. Therefore, you can assume that their pigment ratio to rest of the fruit meat is very high. The same is true for paint, crayons, etc. The greater the amount of pigment and the higher quality of the pigment the brighter, bolder, and deeper your colors will be. The quality of the pigment can also determine the longevity of the color lasting over time and not fading. It also affects how much paint you need to make a new color when mixed with another. The BINDER is what holds in the pigment in a form that allows it to be transferred to a surface. Crayons have a binder of wax. Have you ever bought really cheap crayons that do not color well or seem dried out? That is a result of insufficient pigment and a low quality binder. Can you still make art with such crayons and the like? Of course! That is what this blog is all about. Binders, liquids and fillers are how we can determine whether paint is classified as watercolor, acrylic, or oil. Not all binders are created equal, but then again neither are the pigments. All this to emphasize again that the price range between different brands of paint and student/professional grade paints vary as greatly as the number of colors and brands represented. In addition to the pigment and the binder paints have other liquids and fillers. The amount of liquid can determine how runny or thick paint consistency is. Fillers can vary also and, as stated above as with everything else, they are not created equal. We will not get into all that, though there are a myriad of websites offering information on how there paint is made. Individual brands will also usually have the pigment ratios on their websites. Looking at the diagram above, it may be easy to interpret one paint as being better than the other. 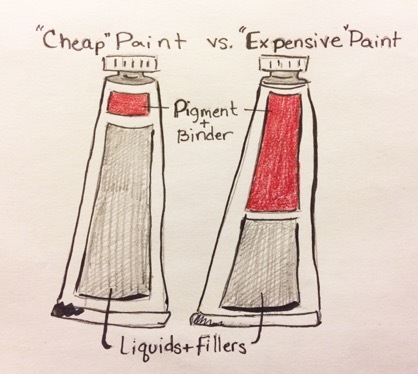 Instead of using the terms cheap paint and expensive paint, it would be better to see them as fulfilling different purposes and generating different results. Why is pigment so important anyways? This is greatly dependent on what kind of project you are trying to complete. Pigment allows for easier mixing of colors. There is less of a learning curve when using highly pigmented color because they do not turn muddy or gray out as easily. The key then to mixing the less pigmented paint or “craft paint” would be that you need to mix much more to get the colors you desire, and even if you do mix the general "red+blue = purple", you may not get the exact result you were imagining. The plus side of the cheaper price of craft paints is that they come in a huge variety of colors so you can just buy the color you want. Since the “thick paints” are more expensive it is important to learn the fine art of mixing in order to save money. With higher quality paints it is possible to achieve the color you want through mixing, but it takes a lot of practice and a basic knowledge of color theory. I will be glad to give a run down of this is a separate post. The best way to save money with the expensive paints is to only buy the basics (red, blue, yellow, black, and white) and mix the rest from there. For those just starting out, it may be more efficient and inexpensive for you to start out with the "buy per color" craft paint to practice with.